Many articles and blogs list different types of foods and beverages as the best foods for burning fat. But what exactly makes them burn fat so well? It's not enough to know whether the snack you are eating or the coffee you are drinking helps you lose weight. It would be good to know what these foods and drinks contain that make them ideal fat burning. Whole grains and cereals. Choose grains and cereals with complex carbohydrates and fibre. Just like with milk, complex carbohydrates are necessary to regulate your insulin levels after a meal. If your insulin levels are high, your body will think that it needs to hang on to its fatty deposits. Choose unprocessed carbohydrates like brown rice, barley and oats. Due to the high fibre content, these foods break down in the stomach at a slower rate. The result: your insulin levels do not spike. There are many vegetables considered as fat burning foods. Asparagus has asparagines that stimulate the kidneys causing a "flushing" effect in the body. It assists in the breakdown of fatty deposits in the cells. Cabbage, which is very low in calories but high in fibre, vitamin C and other nutrients, is a natural diuretic that removes waste from the body. Broccoli, another food high in fibre, vitamins and minerals, aids in the reduction of 'bad' estrogen which raises the body's natural energy-burning hormones. Vitamin C in fruits is said to be able to dilute or liquefy fats. Grapefruits and oranges are not only high in vitamin C, but they are also packed with nature's 'fat broom' fibre. Other fruits and berries have their own ways of burning fats as well. Pectin and antioxidants in apples and berries change the way the body absorbs and uses fats. Bananas are potassium-rich which speeds up your metabolism. Research has shown that skim milk, low-fat yoghurt and other low-fat dairy products help in fat burning. Dairy products contain calcium, a metabolic trigger. A University of Tennessee study found that individuals who consumed 1,200 to 1,300 mg of calcium daily lost about twice as much weight as dieters who took in less calcium. Milk also contains complex carbohydrates that boost the metabolism by keeping your insulin levels low after eating. Jalapenos, habaneros and other types of chilli peppers are considered fat burning ingredients because they speed up the body's metabolism by speeding up the heart rate. Capsaicin, the substance that gives hot pepper its spiciness, is credited with creating thermogenic burn in the body. It also decreases cholesterol, adding to its fat-burning effects. The hotter the pepper, the better it burns fat. If you're searching for additional info on instant knockout review, click on the mentioned above website. Coffee, Green tea and other fat-burning liquids. One of the most popular fat burning liquids is green tea. It has a chemical called EGCG that makes the brain and nervous system run faster aiding in an increased caloric burn. Green tea, like coffee, also contains caffeine which speeds up the heart rate thereby speeding up the metabolism. Caffeine is credited in freeing up the fatty acids in the body so these can be burned as a source of energy. Sources of lean proteins like chicken and turkey are excellent in speeding up the metabolism because they require a lot of energy to break down. Even pork and beef, for as long as they have no fat, can help burn fats. Salmon, Tuna and Sardines. Omega-3 fatty acids, found in these fishes, are considered the healthiest 'good fat' that affects leptin production. Leptin is the hormone that determines what to do with calories: either burn them or store them as unwanted fat. There are many different foods out there that can be considered as fat burning foods like almonds, lentils, beans, certain spices like cinnamon and other fruits and vegetables. Combining these foods in your daily diet, limiting foods high in trans and saturated fats, sodium, and sugar, increasing physical activity and drinking lots of water are keys to improving your body's fat burning capacity. What is kitesurfing? Well a dictionary definition would probably list it as an is "a surface water sport that uses the wind to pull a rider through the water on a small kiteboard" but that's really missing the point. Kitesurfing is all about the rider using a kite and its force to direct them over the surface of the water using the same basic principle as sailing. The rider is attached to the kite via a harness that gives balance and control over the kites direction and speed. You can kitesurf on most open areas of water which can be deep or shallow, calm or rough and if possible with constant winds of between 8 and 50 knots. To be able to kitesurf you will require certain skills. The first and probably most important is the ability to fly and control the kite, which is your main source of propulsion. Once the ability to fly a kite has been mastered the rider must then learn how to ride the board and use the kite to propel them across the water surface by flying a kite in the correct zone consistently to produce enough force to propel both rider and kiteboard. Once the rider has become efficient at the basic, they can attempt more complex manoeuvres such as jumps and tricks. Due to the nature of the sport and its associated freedom, there is no limit to the scope of the manoeuvres and tricks that can be achieved. It is worth pointing out that kitesurfing can be dangerous to both the kitesurfer and other users of the water and surrounding areas, with this in mind it's essential that people interested in the sport first take professional lessons from a kitesurfing school. Well first let look at the kite itself, it's not one of those plastic and bamboo efforts you played with on the beach as a kid that for sure. In kitesurfing, the kite is the means of propulsion, it's the engine and needs to be able to grab wind. To achieve this, the kite uses a framework to add rigidity; the framework is often made from inflatable tubes, solid battens or a double layer of cloth. This gives the kite a cell arrangement which helps maintain a fixed shape. Inflatable kites are more common as they are considered easy to re-launch after a crash into the water. Most kites are controlled by bars which include a "depower" system which reduces the kites angle of attaching to the wind, thus catching less wind and reducing power. Bars are also more suitable for one-handed riding which gives the kite surfer more scope when performing tricks and jumps. Connecting the bar to the kite is achieved by a system of lines manufactured from non-stretch materials. 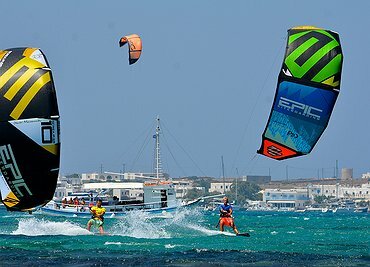 Are you hunting for kitesurfing spots greece? Check out the earlier discussed site. Many lines and complexity vary depending on the type of kite, but normally there are 4 or 5 lines with a typical length of 23 meters. Kitesurfing harnesses come in several forms, seats with leg loops, waist or vest. The harness attaches to the control bar and takes the majority of the strain applied via the kites pull off the rider's arms. There is a vast variety of kitesurfing boards on the market, but the most popular are multi-directional twin tip board, symmetrical boards. Boards come with sandal type foot straps that attach the rider to the board; the rider can detach and attach these very easily. Kitesurfing boards are of a similar construction as snowboards with high compression cores and harder rails. Most serious injuries that occur while kitesurfing is due to being lofted into the air or dragged out of control resulting in collisions with hard objects including sand, water, buildings and power lines. Yes, it is possible to seriously injure yourself colliding with water from height at speed! Lofting and dragging often happen in excessive weather conditions, so a good understanding of the weather is a must. You should always have a buffer area downwind of any hard or hazardous objects to give yourself enough reaction time. Never kitesurf alone, always take a friend and keep an eye on each other. Finally get some kitesurfing training, it's the only way to start and enjoy kitesurfing, and there are loads of great schools offering kitesurfing lessons. Bulgaria is a welcoming European country positioned between Romania and Greece. Opened to the Black Sea, Bulgaria has managed over the years to develop its touristic side tremendously. More and more people are looking at the country as a perfect summer spot. Affordable, beautiful and entitled to luxurious facilities, travellers to Bulgaria will manage to have an amazing time. From the touristic point of view, Bulgaria is similar to Greece. Although it doesn't have the superb history, it has the amazing smooth beaches. The German influences on Bulgaria have left a visible sign upon the touristic activities from Bulgaria. The quality of the services, the hotels and the amazing restaurants has managed to win people's attention. Bulgaria is a friendly country where you can relax and enjoy the accessible offers. The affordable and tasty cuisine, the smooth sand and high-quality wine have succeeded to make the place an ideal summer destination. Most hotels have 4 or 5 stars; featuring wonderful service systems and an array of activities, it's impossible to get bored in Bulgaria. Most of its beaches have the famous blue flag, where the water is crystal clear, warm and peaceful. The Bulgarian coastlines are as varied as the country's geography. Entitled with plenty of lagoons, dunes, abrupt hills and fabulous mountains, tourists will manage to have the time of their lives in Bulgaria. Come to enjoy a charming vacation; surrounded by warm temperatures and exquisite scenery, travellers from across the world have started to come to Bulgaria in the past three years. Begin your enticing getaway with Nessebar. The municipality and its included resorts are positioned on the southeastern side of Bulgaria. Because of this travellers will have the chance to enjoy higher temperatures and more sun compared to the rest of the territory. The municipality consists of numerous resorts and spas. The surreal bays and crystal clear waters will be everything you need for an exquisite summer vacation. Beaches are wrapped by the golden sand while the safe, clean sea will make sure to keep you as relaxed as possible. Moving on, if you want to experience the meaning of outstanding amusement, you have to check out Sveti Vas. The remarkable resort town is positioned on the southern side of the Stara Planina Mountain. The destination spreads across the north Nessebar Bay, and it is almost 10 km away from the centre. If you want to check out the surroundings as well, you'll meet on your way the largest Bulgarian resort namely, Sunny Beach. Go to the below mentioned site, if you're looking for additional information regarding flights to bulgaria. Sveti Vlas is away from Bulgaria's urbanism. Therefore, it is mostly preferred by couples and honeymooners looking to enjoy tranquillity and relaxation. Families travelling to Bulgaria can easily opt for the most traditional seaside town, namely Sozopol. Entitled with plenty of ruins, customs and traditions, onsite you'll have numerous engaging activities to try out. Families usually like to explore the port, travel through the city and admire the breathtaking scenery. Last but certainly not least, the centre piece of Bulgaria is Varna and the Golden Sands Resort. Known as one of the largest in the North Coast of the Black Sea, Golden Sands is a place preferred by most tourists travelling to Bulgaria. The mineral waters, lavishing hotels and fun activities will ensure a fabulous getaway. Additionally called the pearl of the Black Sea, Varna has an extremely developed tourism. Very well promoted and advertised, the city has managed over the years to impress its customers by offering great deals and affordable packages. Whenever you're seeking to benefit from an exquisite summer retreat, remember that Bulgaria will wait for you with some of the best and most convenient offers.